Phase 2 construction is well underway and continuing to progress with the help of Giusti Group Limited Partnership. Giusti provides an array of products and services related to the concrete construction industry. With over 40 years of service in the industry they have gained vast experience, knowledge, practices and techniques that are second to none and are only gained through dedication and commitment to being the best. 1) Giusti recently celebrated 40 years in business, tell me about how Giusti started as a company and how you’ve gotten to where you are today? My father immigrated to Canada at 17 years of age. He came over sponsored as a journeyman welder and quickly went from welding to building single-family homes. Then from single-family homes to multi-family homes. At one point we had over 120 framers working for us to do the form-work for the parkade to then frame the buildings above. 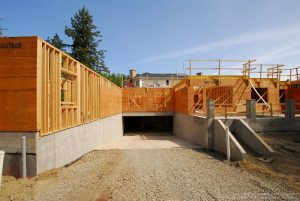 We really established a niche in that single to double level parkade structure with 4-6 story wood frame structures. As the company grew we started to take on more and more concrete type scopes. Our biggest project being Husky Sunrise which was over 25,000 cubic meters of concrete where we employed up to 1000 people at one point. Our operations now are throughout Western Canada – both British Columbia and Alberta. In Alberta from Fort MacMurray to Edmonton to Calgary and surrounding areas. In BC from one point of the island to the other and as far as Kamloops, Kelowna, Penticton and all over the interior as well. 2)	We have really enjoyed working with Giusti thus far on Phase 2 of our development. In the construction industry, what separates Giusti from its competition? We are very much an engaged ownership group where most of our foremen have worked alongside the owners. Our team leaders have been with us over 10 years so they understand what the expectation is – a commitment to deliver a safe and quality product every time. The other advantage is that we are fortunate to have a family/father who is continually invested in the company and is always investing in technology that is out there, whether it was for scaffolding or wall forms. We are very fortunate to be well funded and very well supported in the materials that we work with. 3)	I think it’s great Giusti is a family company and is quite similar to Pacific Landing in that sense. What does that mean to you and how does is it translate or reflect through your company’s culture? You want to be surrounded by people who embody the same qualities and beliefs: providing quality work, doing things right the first time, and understanding you owe it to the client to do your best job every time. That client has a lot of choices out there so we are appreciative that they choose us. 4)	Pacific Landing is designed around creating a new waterfront community. Giusti volunteers its time and sits in on multiple committees and associations. Why is it so important for Giusti to be involved in the local community? Alberta has been very good to our family. We saw several years of continuous growth which really helped changed the course of our destiny for a lifetime so it’s important to support those charities that require the funding of local companies to allow them to continue. We are always happy to give back! 5)	What are you most proud of in terms of how Giusti operates as a business? I’m very proud to know that wherever it is that we are working within Western Canada, more often than not the superintendents who have been working in the industry for 10, 20 or 30 years, once they work with our group of companies it’s a positive experience for them. They see how well organized we are and they see the Giusti difference. 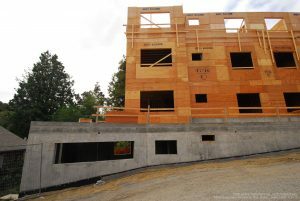 Phase 2 construction of The Douglas is well underway at Pacific Landing. We are now up to the third floor of framing and are scheduled to begin framing the fourth floor in the coming weeks. Register with us today to discover how you can own of these beautifully crafted Phase 2 suites.